Most of the [Israeli] public is not interested in examining the question of whether there is something illogical about Israeli policies. That Israeli majority is not ready to listen to hints that perhaps the military policies prevent, in the short term, some of the attacks and destroy the infrastructure, but in the long run create hundreds more volunteers for the unofficial Palestinian armies, and increase the danger of terrorism. -- Amira Hass, Terror As A Natural Phenomenon, Ha'Aretz 15 Jan 2003. 12 June 2003: IDF kills cousins Fadi and Salah Jaradat, during incursion into Jenin. September 2003: IDF refuses four requests from Tayseer Jaradat, father of Fadi, for permission to travel from Jenin to Haifa for medical treatment (advanced liver cancer). 4 October 2003: Hanadi Jaradat, daughter of Tayseer, sister of Fadi and cousin of Salah Jaradat, carries out suicide bombing in Haifa, murdering 19 Israeli diners at Maxim's Restaurant. 15 December 2003: IDF assassinates Fadi Hanani during month-long incursion into Nablus. 25 December 2003: Saed Kamal Hanani, 21, cousin of Fadi Hanani, blows himself up at Geha Junction, near Tel Aviv, killing four Israelis. 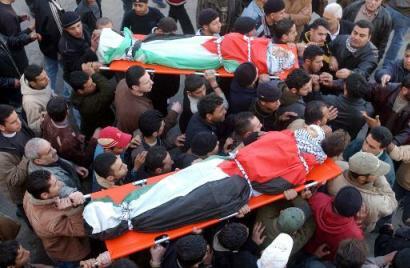 3 January 2004: Palestinian mourners carry the body of Amer Arafat, 20, at bottom, and Amjad Bilal Al Masri, 15. 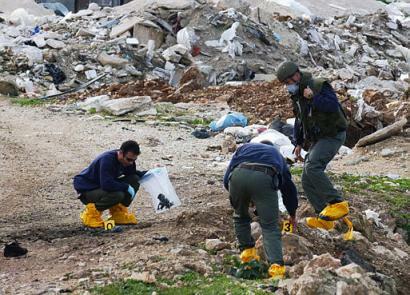 Al Masri was shot by an Israeli sniper, during the IDF's month-long incursion into Nablus. 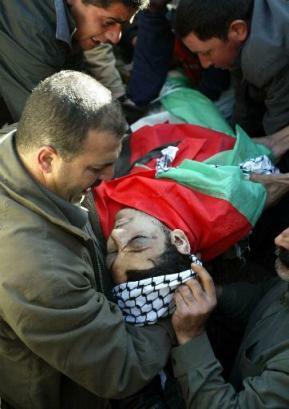 4 January 2004: Family members mourn as they lower into a grave the body of Mohammed al Masri, age 20, who was shot in the head by an Israeli soldier a day earlier while walking in the funeral procession of his cousin, Amjad. It is impossible to eradicate the terrorist infrastructure....The [IDF] operations themselves become the hothouse that produces more and more new suicide bombers. The military actions kindle the frustration, hatred and despair and are the incubator for the terror to come.